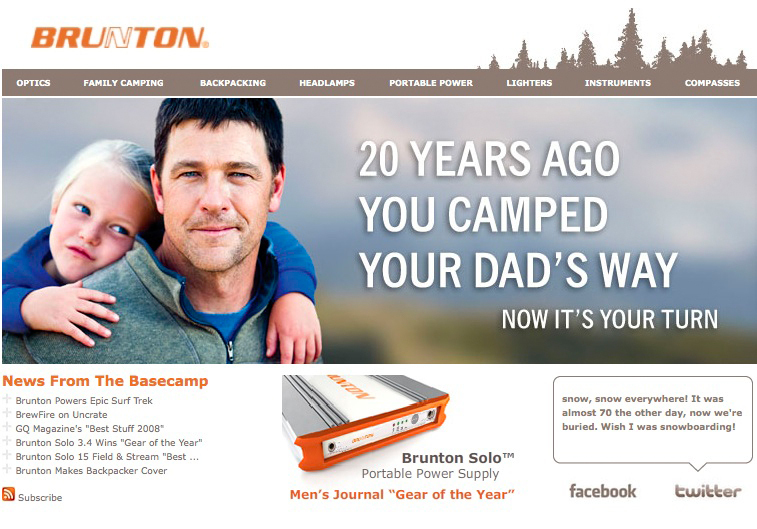 What a fun campaign we shot with Brunton! I got the chance to work with a new company with people I know well – it was a great shoot. This Brunton 2008 campaign takes their products back to the companies roots, and their optics strive to keep the outdoor life simple, but quality. I loved working with a company who values the outdoor lifestyle and works to show the power of getting out. Marketing director Jason Kintzler wanted to produce a variety of portraits that were simple yet powerful in composition and subject. It was a great time working with him, and I loved being able to work under his vision and great art direction. Each of the models brought a great energy to the shoot and I really think we finished out with a powerful final product. Thank you, Jason, for bringing your energy and vision – this campaign turned out great! Pictured here is the rugged Will Lamont and his daughter. I have worked with Will on multiple projects and have gotten to know him well as he has modelled for me with multiple companies. Cabela’s has plenty of catalogs and workwear shoots with his talent, and I am excited to have him working with us on yet another brand shoot. The Brunton 2008 campaign definitely benefitted from him, and everyone else we worked with, as a part of this portrait shoot. One of Canon’s prestigious Explorers of Light, Tyler’s creative passion is using lenses to tell heartfelt stories. Apple, Adidas, The North Face, Patagonia, Wrangler, Timberland, Cabela’s, Stetson, and dozens more have hired him to shoot provocative commercials with wide-angle footage that transports viewers into every scene. Using dynamic lighting and handheld camera work to charge his projects with emotion, Tyler has become one of the most sought-after commercial directors, photographers, and multimedia lecturers in the nation.